Two knee surgeons in Belgium say they have identified a previously unfamiliar ligament in the human knee. Writing in the Journal of Anatomy, they suggest the fibrous band could play a part in one of the most common sports injuries worldwide. Despite glimpses of the ligament in medical history, this is the first time its structure and purpose have been so clearly established, they say. But experts say more studies are needed to prove its relevance to knee surgery. Four main ligaments - or thick fibrous bands - surround the knee joint, criss-crossing between the upper and lower leg bones to provide stability and prevent excessive movement of our limbs. But the anatomy of the knee remains complex, and several international groups have been exploring the less-defined structures of the joint for some time. The notion of this particular ligament was first made by French surgeon Paul Segond in 1879 but it has evaded definitive surgical classification for many years. Now building on the work of other surgeons, Dr Claes and Professor Johan Bellemans of the University Hospitals of Leuven, Belgium, say they have closely mapped the band which runs from the outer side of the thigh bone to the shin bone. And they say this anterolateral ligament could play an important protective role as we twist or change direction. Mr Joel Melton, a consultant knee surgeon at Addenbrooke's Hospital, Cambridge, UK, who was not involved in the research said: "If you look back through history there has been a veiled understanding that something is going on on that side of the knee but this work finally gives us a better understanding. "I think this is very exciting - there is no doubt they have hit upon a very important anatomical structure." The Belgian surgeons used macroscopic dissection techniques to examine 41 donated knee joints and pinpointed this ligament in all but one specimen. 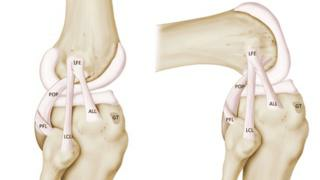 Image caption The knee joint is surrounded by ligaments to provide stability and support. And they say the presence of this band could help them better understand and treat a common sports injury that has puzzled doctors for some time - the anterior cruciate ligament (ACL) tear. An injury to the ACL is typical in people who pivot during sport - from athletes and basketball players and footballers and skiers. A tear can happen when you change direction rapidly or stop suddenly and causes pain, swelling and reduced movement in the knee. But despite improvements in surgical techniques, between 10-20% of people with a repaired ACL tear are unable to recover fully. In particular, some patients say their knees give way as they twist or turn. Dr Claes and Bellemans think an injury to the anterolateral ligament (ALL) may be partly responsible for this. They hypothesise some people may injure the ALL at same time as the ACL, leaving the knee less stable as the leg rotates. And their biomechanical studies suggest tears in this ligament may also be to blame for small fractures that have previously been attributed to ACL injuries. Mr Paul Trikha, a knee surgeon at the Surrey Orthopaedic Clinic, who was also not involved in the research said: "I do around 150 ACL repairs each year. When I saw Dr Claes' research, it blew me away. "Knowing about the ALL has given us a better understanding of what other structures may be damaged during this common injury and this will hopefully open up opportunities to improve surgery for our patients." But reaction to this work has been mixed. Gordon Bannister, professor of orthopaedics at Bristol University said: "There is no doubt this is a very interesting paper from the anatomical point of view but at the moment this is not a major clinical breakthrough. "Its role in knee injuries is a perfectly reasonable hypothesis to test but the most important step is to see whether any intervention to the ligament actually makes a significant difference to patients." Dr Claes and Bellemans have already started exploring this possibility and are offering repairs of the new ligament in certain cases. Their next steps are to refine their techniques and monitor their patients to see if there are lasting improvements to their mobility. Dr Claes said: "We surgeons may need to rethink what we know about common ACL injuries. Though we have shed light on the purpose of this ligament and its role in common injuries, we now need to find out for certain when it is best to intervene surgically. "Long-term studies will give us that answer and hopefully allow us to perfect a minimally invasive techniques to give our patients a better recovery."